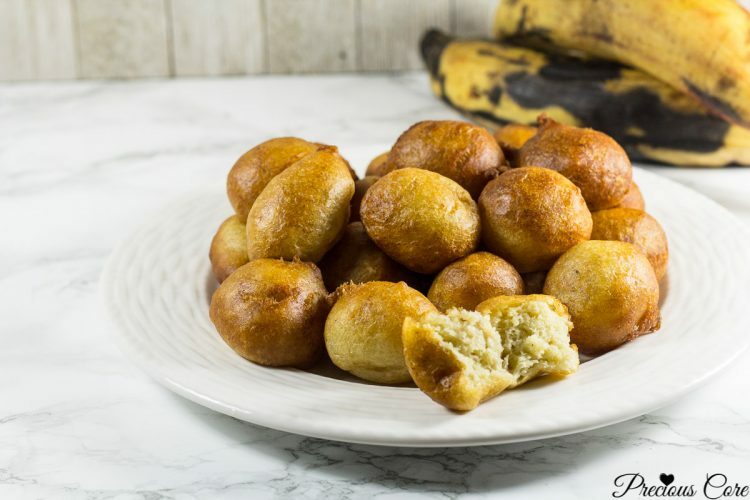 This plantain puff puff recipe is based on puff puff recipe, which is a common African snack. The addition of plantains, another African favourite is a great twist to this well-loved snack. A bite of this is like having fried ripe plantains and puff puff at once. 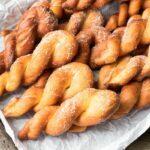 It is the best of both worlds – so tasty and equally very easy to make! The other day, Mr N came home with lots of plantains. I fall in love with my man over again each time he walks through the door with any form of food stuff. To me, it is romantic. So he bought plantains and I was so happy because I have this sense of security when there’s enough plantain in my kitchen. That means my plantain favourites like Poulet DG and Plantain Porridge can happen. This time around, none of those happened because my plantains got ripe so fast! After grilling some, I decided to go on a plantain adventure with with the rest. 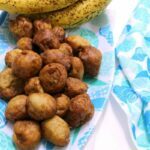 First up is this plantain puff which I simply made by blending overripe plantains and adding to regular puff puff ingredients. We had it for breakfast. It was so good, my girls didn’t want to stop eating. I had to make them stop because I didn’t want them eating too much fried food at once. It was a real battle for me to stop eating too. 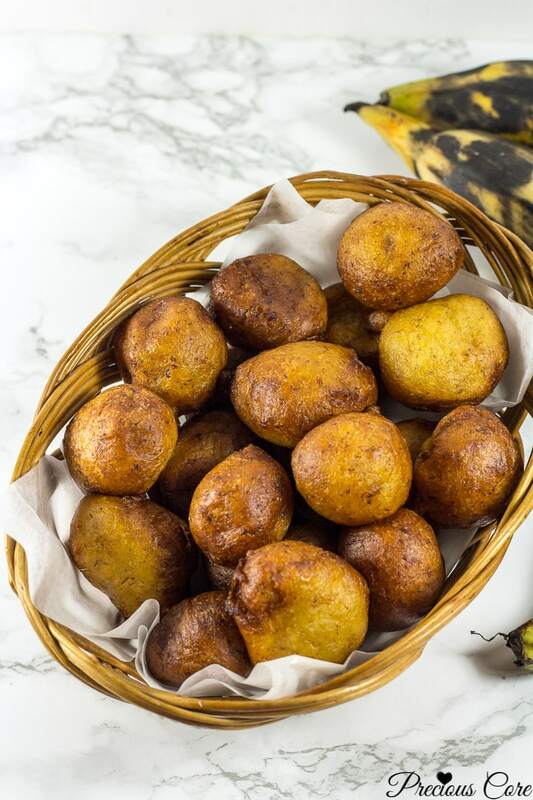 Plantain puff puff is the very definition of wickedly delicious. No, I’m not kidding. I shared a photo on my Facebook page and Instagram and my life changed. By my life changed, I mean requests for the recipe started pouring in from the North, South, East and West. So I did what any good foodie who loves to share will do. 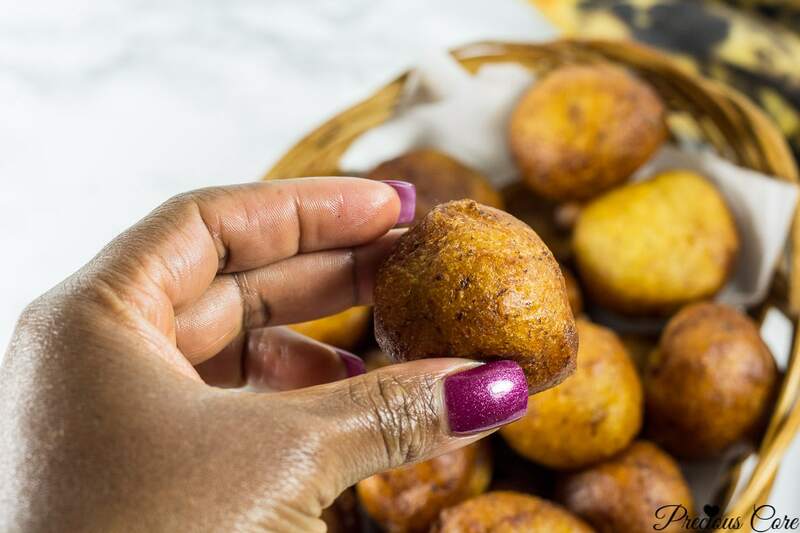 I made a video to document the perfect plantain puff puff recipe and I took more pictures so I could show you guys this awesome deliciousness. Now listen: don’t you ever ever ever throw away your overripe plantains. 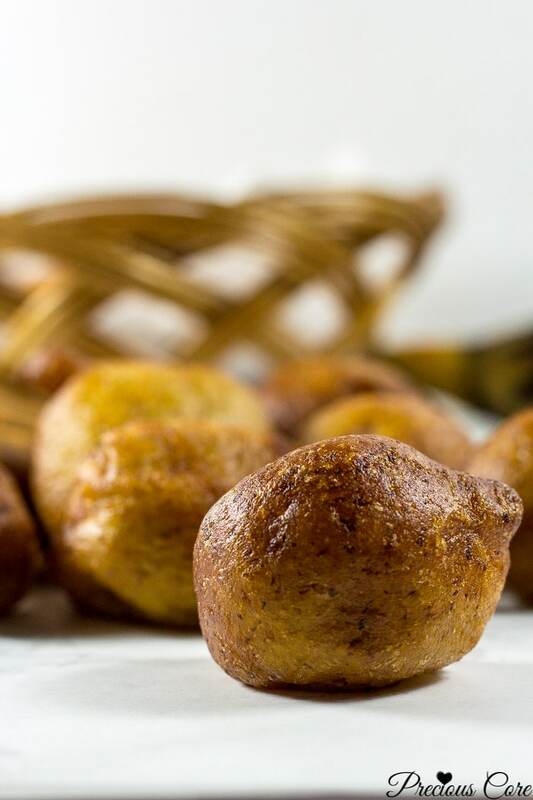 Use them to make these plantain balls and you won’t regret it. They are sweet, fluffy on the inside and so tasty! And you do not need to add any extra sugar – the plantains are sweet enough. The secret here is to use plantains which are very ripe and soft. 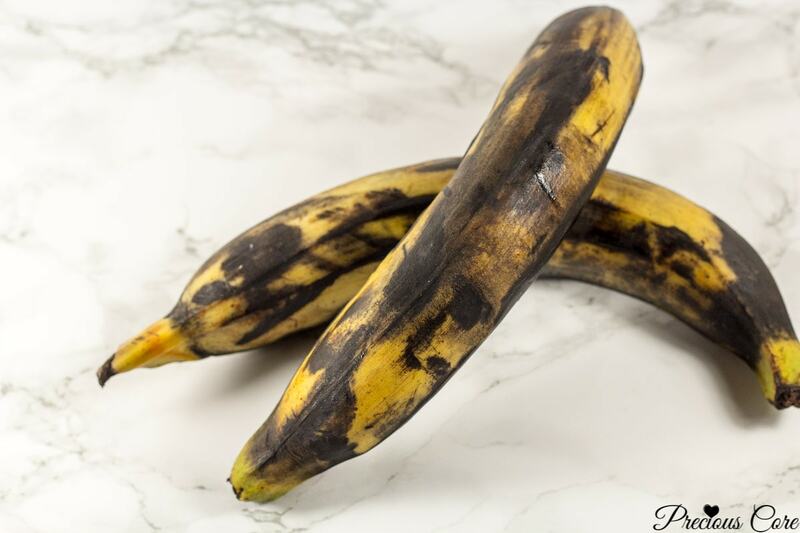 When plantain is overly ripe, the skin changes from yellow to black. The blacker, the better. 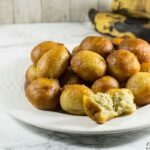 Plantain puff puff is very easy to make. As you’ll be able to see in the video, it is a no-fuss recipe. Hope you enjoy this new love my family has found! If you have not subscribed to my YouTube channel, click here to subscribe so you never ever miss any of my videos. More are on the way, I tell ya. 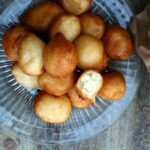 Puff Puff is a popular African street food that is insanely tasty. 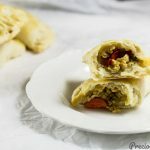 This version is made with overripe plantains. It is a great way to use up overripe plantains. I must say here that it is slightly addicting. I had to stop my kids from consuming too much. They didn't want to stop eating. It may happen to you too. Pour half a cup of warm water into a large bowl. Add in your yeast and set aside. Peel the plantains and blend together with remaining 1 cup of water until smooth. Alternately, you could mash the plantains in a bowl with a fork then add the water and stir to combine. Pour blended plantains into yeast mixture. Add salt and stir well. Add in flour in little bits, stirring each time you add some. Stir to form a batter. You should be able to hold the batter in your hands without it falling out quickly. If it is too light, add more flour. If it is too thick, add more water. Cover the batter with plastic wrap and let it rest for about 40 minutes. Heat oil in a large pot for 5-10 minutes on medium heat (350 degrees F or 180 degrees C). Drop tablespoonfuls of batter into the oil to fry. Be careful not to overcrowd the pan. Let the balls cook for about 5-10 minutes until golden brown. Flip the sides half-way through. Remove and place on paper towel to absorb excess oil. Ehen, if you make this recipe, please snap a picture and share with me on Facebook or tag me on Instagram. I’ll love to see! Thank you very much Precious. I am currently based in Abidjan Côte d’Ivoire where we have lot of plantain. I’ll definitely try this one. I love plantain. Hi Fassouma, this is a really great way to use up all that plantain. I love plantain too. So versatile! Love this recipe! I am adding it to my “must make stash”, especially with the way you described it. You have a way with words when it come to enticing people with food honestly. I see your nails looking really good btw! Awwww, thanks Lois! It is definitely a must-make. SO GOOD! Ah! I didn’t know that plantains could do this. Thanks, Precious. I’d definitely try this out soon, it looks so damn good. I need to visit your house one day, you can’t keep doing this to us lol. Well done! I’m assuming food is your love language when you described how Mr N bringing food home makes you happy. Hahaha. 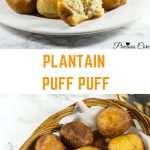 Wow, these plantain puffs do look yummy! Just keep them coming. We’re learning a whole lot from you sis. With skills like yours, we can’t afford to fall short in the cooking department. Hi Reinarte, I’m guessing your oil wasn’t hot enough. When the oil isn’t hot enough it tends to drink oil. Heat up the oil on high heat then turn the heat down to medium and fry. Your oil should neither be too hot nor too cold. Also, always follow my exact measurements for best results. Hope this helps. Hi Lanny. if using your hand is hard you could use a tablespoon to drop the batter into the oil. Hope this helps. Your description of Plantain puff-puff moved me to try it. But, instead of plain water, I used low fat milk and egg-white plus a little sugar, instead of salt. I will make some for Thanksgiving and Christmas, and will surely remember to snap pix to post for your comments. So glad to hear this, Hermann! Thanks for sharing and Happy Thanksgiving! Hi Precious, I love your recipe. I was first sceptical about its veracity, given the amount of flour required. However, for the first time, I made mosa that was not oil soaked and flat. In the written version, you did not include the fact that one had to set the dough aside for the yeast to act. I decided to check the video just to verify and found that the video contained that element. I will check out other recipes on your blog. Thanks!!! Thanks so much for the feedback, Bolanle! I will update the recipe now to include that. Glad you loved it! Hi Precious. Can I bake this in the oven. Hi Shirley, I’m sure you can but truth be told, they taste better when fried. To bake, I suggest baking in cupcake pans since the batter is dripping. Please let me know how it goes if you try that.